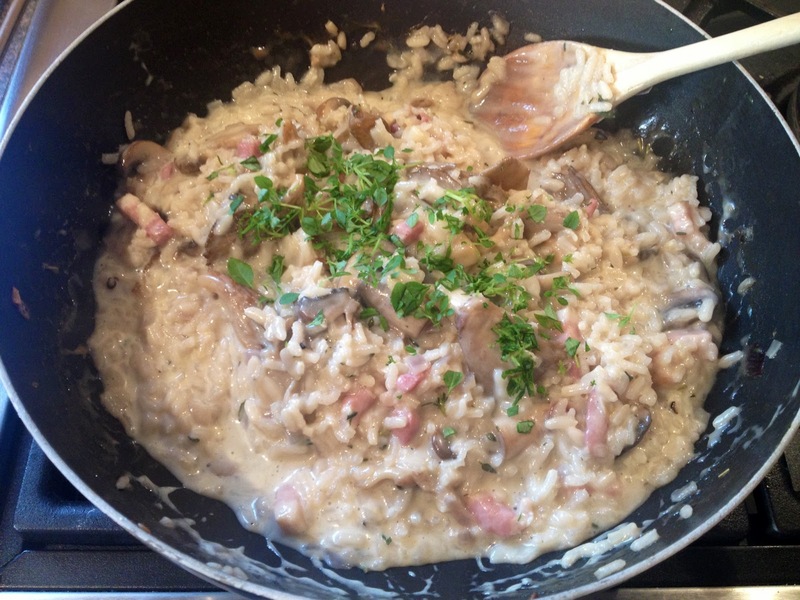 If you’ve ever paid any attention to anyone who’s ever told you risotto is really hard to make… ignore them. When I first tried to make it I was completely baffled as to why it’s got this reputation. 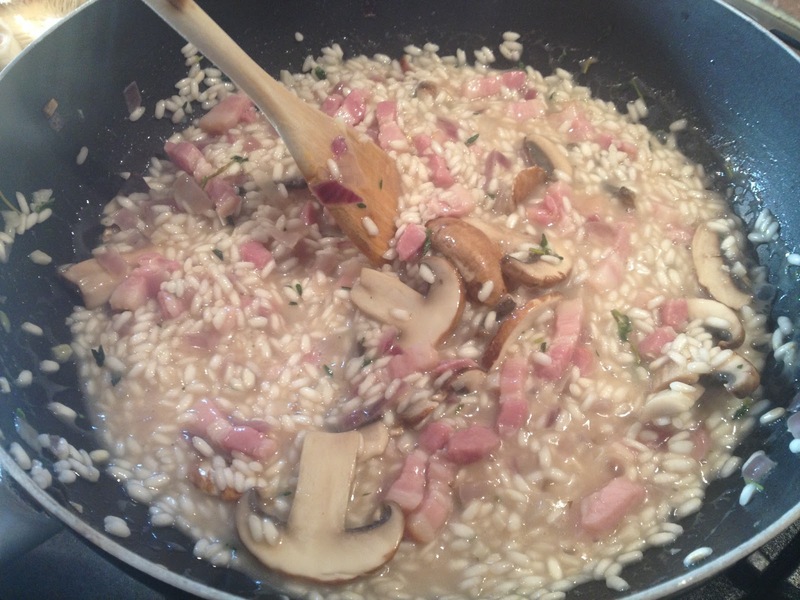 Unless you’re really lazy and can’t be bothered to watch it and stir it a bit, risotto is a piece of cake. I love risotto. There’s something really indulgent about it, particularly when you’re not watching the calories and pour a load of cream into it, as per this recipe. If you do want to make a healthier version though just leave out the cream and go easy on the parmesan… it’ll still be delicious. 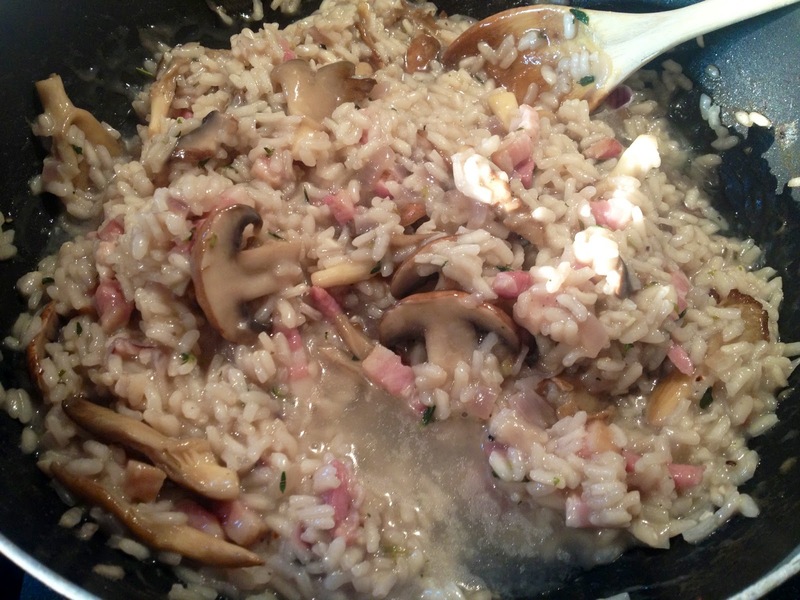 Risotto is one of those great adaptable, throw in whatever you’ve got in the fridge kind of recipes (see my vegetable risotto recipe) and my favourite way to do it is with mushrooms and bacon. I felt like trying out a few different kinds of mushrooms when I made this, but feel free to mix and match your varieties as long as you have roughly the right amount overall. 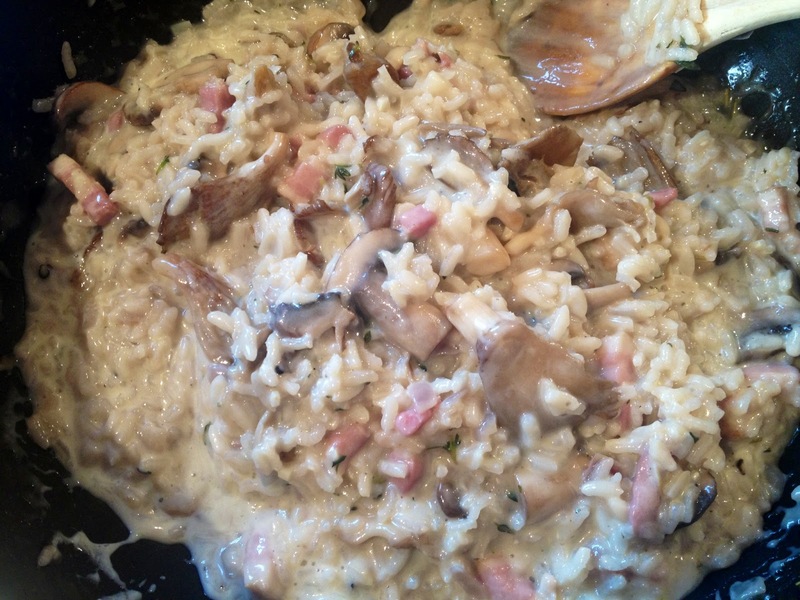 I quite often make a risotto on its own as a meal, but this one I was doing for a birthday dinner for my Mum so I was trying to make a bit more of a complete dish. 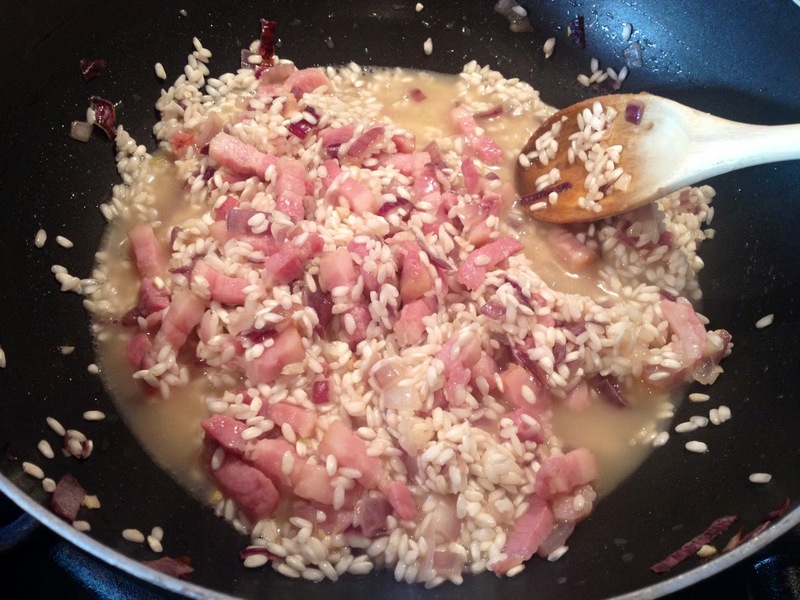 The chicken and parma ham work perfectly with the flavours of the risotto and don’t really require much additional work to do. 2. Wrap the chicken breasts in parma ham. Create a parcel of foil, seal, place in a baking tray and bake in the oven for approximately 25 minutes. Keep an eye on the time and remember to remove from the oven if it’s done before you’ve finished the risotto. 3. 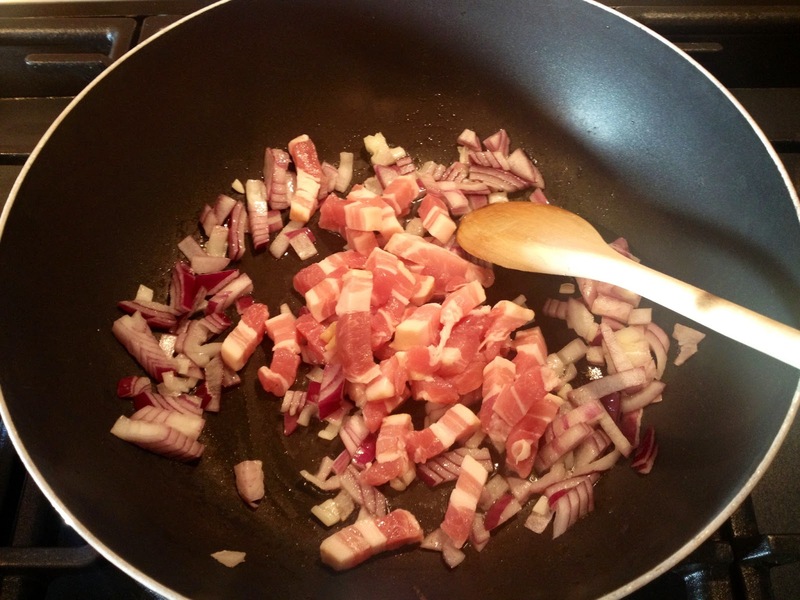 Begin to fry the bacon and the onions in a large pan. 4. 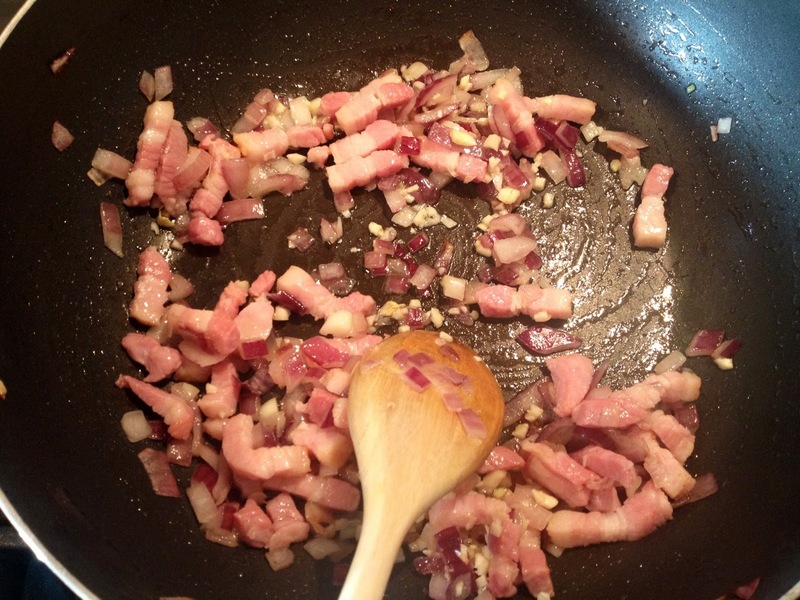 When the bacon has a cooked a little and the onions a little softened, add the garlic. 5. 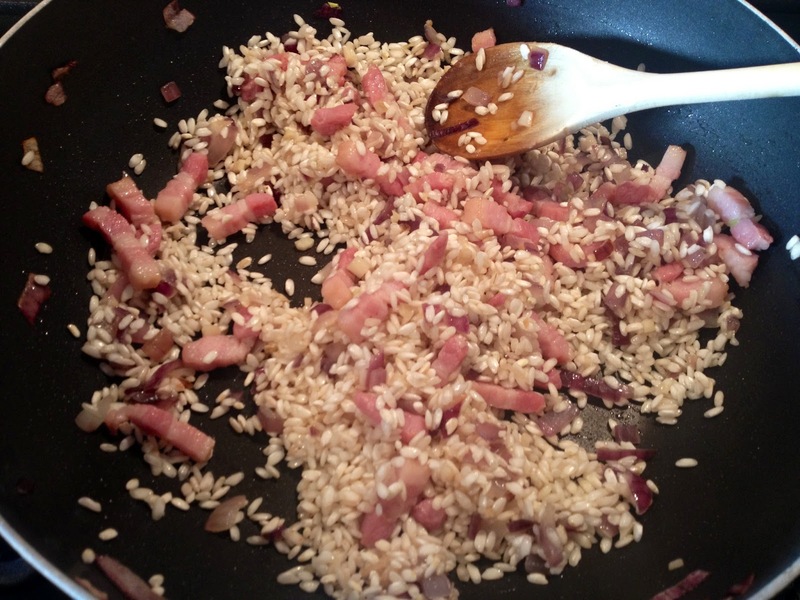 Add the rice and stir through, allowing the grains to be thoroughly coated with the oils from the pan. 6. Once the grains are throughly coated, begin to add the stock a little at a time. 7. 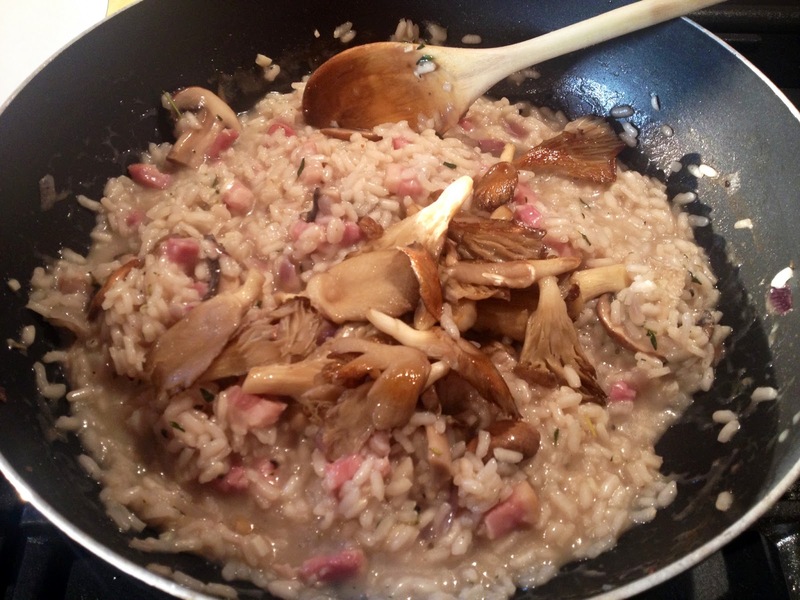 When the rice has begun to cook a little, add the chestnut mushrooms and the thyme. 8. 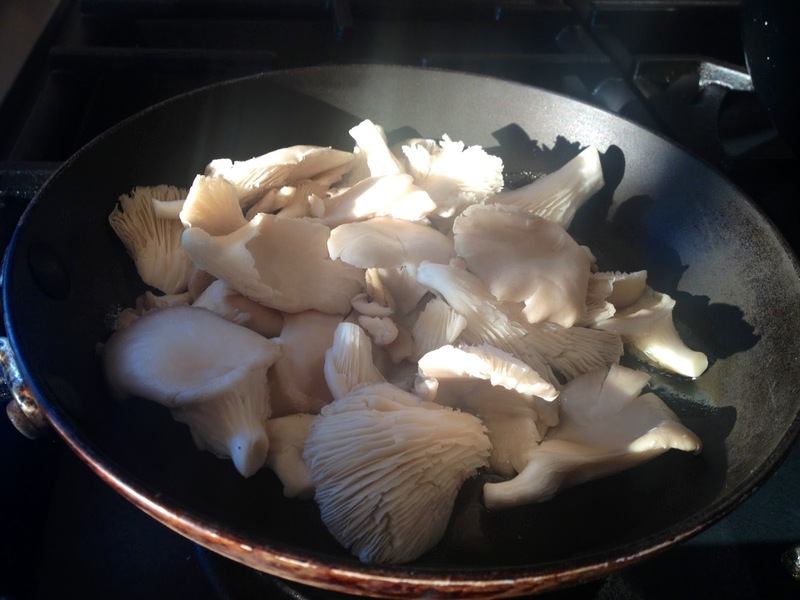 In a separate small pan, begin to fry the oyster mushrooms. 9. Continue adding stock the rice as it reduces, don’t let it dry out. Continue until the rice is cooked. If you use up the stock continue with water. 10. When the rice is almost cooked grate in a generous helping of parmesan cheese. 11. Add the cooked oyster mushrooms and stir through. 12. Add the cream to the mixture and again allow it to reduce a little. 13. Check on your chicken, it should be done by now. 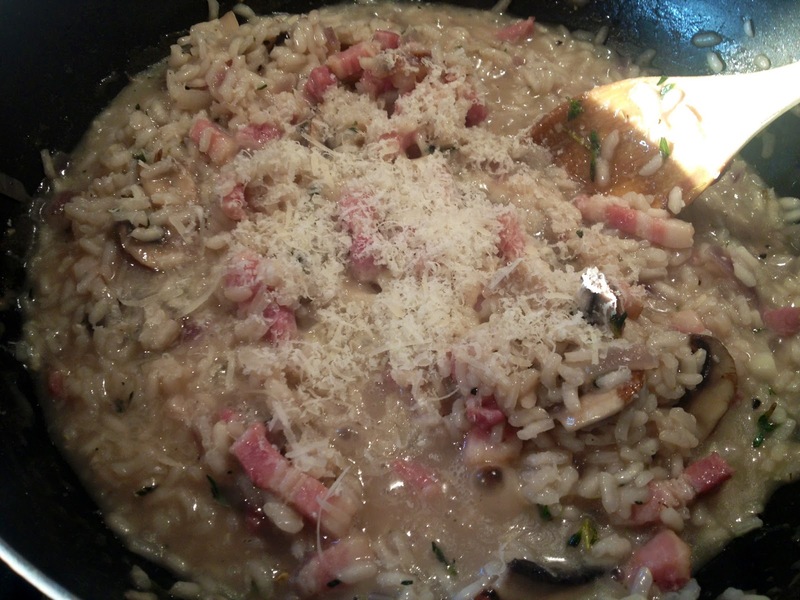 Remove from the oven and allow to rest for a minute while you finish off the risotto. 14. Add the basil and stir through. 15. 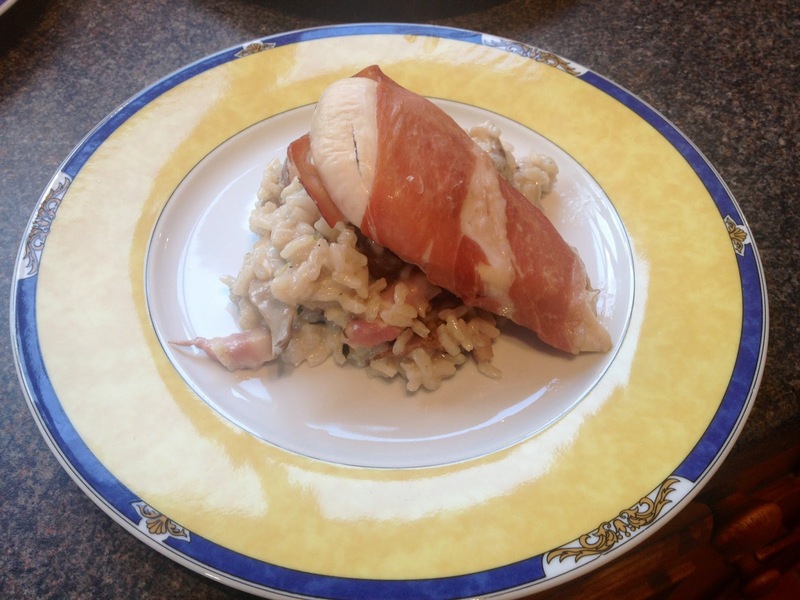 Dish up a portion of risotto on each plate and rest a chicken breast on top of it to serve.